❤This digital vlog camera is very small and you can use the strap to take along when you have a holiday or go outing.Its portable size makes your young children or elder old easily to use the strap around their neck so that it will not drop accidentally.The UV lens come with the standard package which protects your lens from rain or dust, and at the same time it can filter the UV ray. ❤This digital camera with wifi supports full 2.7K [email protected] video resolution and 24MP picture resolution with good image quality. Also it supports wifi function. Download the “PPShow” APP on your phone so that you can view the pictures and videos on your phone directly. It has 4X digital zoom which makes you clearly see the scenery near or far away. You can press the W/T button to zoom in or out to look further. It is easy to switch between “Video” and “Picture” MODE by pressing the “M” key. 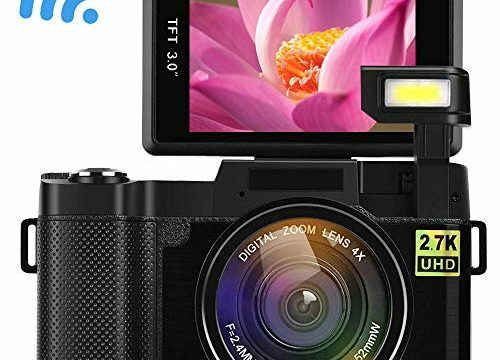 ❤This vlogging camera with flip screen has a retractable flash light and the 3 inches LCD screen can rotate 180 degree for selfish.This is a good chooice for you to share your happiness to your social media such as Facebook,Youtube,Twitter,Instagram and so on.It is easy to transfer the video or picture files to your Windows or MAC computer through USB cable and it is automatically recognized by your computer. ❤This point and shoot digital blogging camera supports standard 52mm wide angel lens, fisheye lens and teleconverter lens. It will meet diversified requirements of photography by connecting with different lenses(Need to purchase seperately).You can mount this camcorder on a tripod so that you can do some vlogging. (Tripod is excluded in the package). ❤One-year warranty is provided by SEREE. Customer service will be provided within 24 hours.The battery for this camera is 800mAH, please kindly full charge it before using. A micro TFT card beyond class 10 is nessary for its using. It can supports external micro SD card up to 32GB (Exclude in standard package).